AMD is one of the commonest causes of vision loss in the elderly. It selectively affects the macula which is the retinal area responsible for fine central vision. Usually your side or peripheral vision remains unaffected. Early AMD, where yellow deposits called drusen accumulate under the retina. In these early stages, your vision typically remains unaffected. Dry AMD or Geography Atrophy (GA) where the retina atrophies and vision loss is slowly progressive. Wet AMD or Choriodal Neovascular Membrane (CNV) where new and abnormal blood vessel grow under the retina and bleed or leak fluid which results in vision loss. Who is at risk of getting AMD? Persons with early AMD need to monitor their vision carefully with an Amsler chart on a weekly basis, covering one eye at a time to ensure that both eyes are assessed independently. If you notice any distortion or decrease in central vision, please make an urgent appointment with me as this could indicate progression to late advanced AMD. Persons with late wet AMD typically need anti VEGF injections directly into the eye with a very slender fine needle. This drug typically stays in the eye for 4 weeks and repeated injections are required. They slow down and attempt to stop bleeding or leakage from the abnormal blood vessels. At times laser surgery can be used to treat certain types of wet AMD by destroying the leaking vessels. Patients with diabetes can have an eye disease called diabetic retinopathy. This happens when high blood sugar levels cause damage to blood vessels in the retina. These vessels can swell and leak or they can close completely stopping blood from passing through. Sometimes abnormal new blood vessels grow on the retina. All these changes can lead to vision loss. Careful eye examinations in persons with diabetes are extremely important. This is the early stage of the disease process. In NPDR, tiny blood vessels may leak and make the retina swell. When the area responsible for central fine vision, the macula, swells, we call this macular edema. This is the most common reason why people with diabetes lose their vision.In some cases the vessels can close off at the macula causing macular ischaema which again results in vision loss. PDR is the advanced stage where abnormal blood vessels grow, This process is called neovascularisation. These fragile new vessels often bleed into the eye causing swirls and floaters. It can also result in sudden severe vision loss. The aim of diabetic monitoring is to try to prevent this stage of the disease. How is Dabetic Eye Disease treated? It is extremely important to optimise the control of your sugar levels aiming for HBA1C around 8%, normalise your blood pressure and cholesterol control with medications. I will liaise with your GP to ensure this happens, please bring along all your medications and problem lists to your consult. Vitrectomy in very advanced PDR cases to surgically remove the gel body of the eye, blood and scarring present in the eye. Why does the retinal veins occlude? The eye has one main artery and one main vein that carries blood into and out of the eye respectively. The vein is typically blocked by a stiff artery running across the vein. The artery becomes stiff with age, this is worsened by high blood pressure, diabetes and cholesterol in a process called arteriosclerosis. The resultant vein occlusion results in poor circulation of blood and fluid out of the eye and they leak out within the eye instead. The macula swells up and vision is affected. This can happen suddenly or over several hours. How is vein occlusions treated? I will liaise with your GP to ensure that your blood sugar levels, blood pressure and cholesterol control is optimised. The main stay of treatment is anti-VEGF injections into the eye to reduce the macular swelling. In cases of severe disease, abnormal blood vessels that bleed into the eye may develop and laser treatment may be necessary to destroy the sick areas to stabilise the disease. If unmonitored, uncontrolled and untreated, this can lead to neovascular glaucoma which can lead to a painful blind eye that is difficult to manage. Retinal vascular conditions, laser treatment for retinal holes and tears, Central serious chorioretinopathy. AMD causes your vision to change over time. You may not notice these changes when they happen. However it is important to catch vision changes as soon as possible because treating them early can help slow or stop further loss of sight. 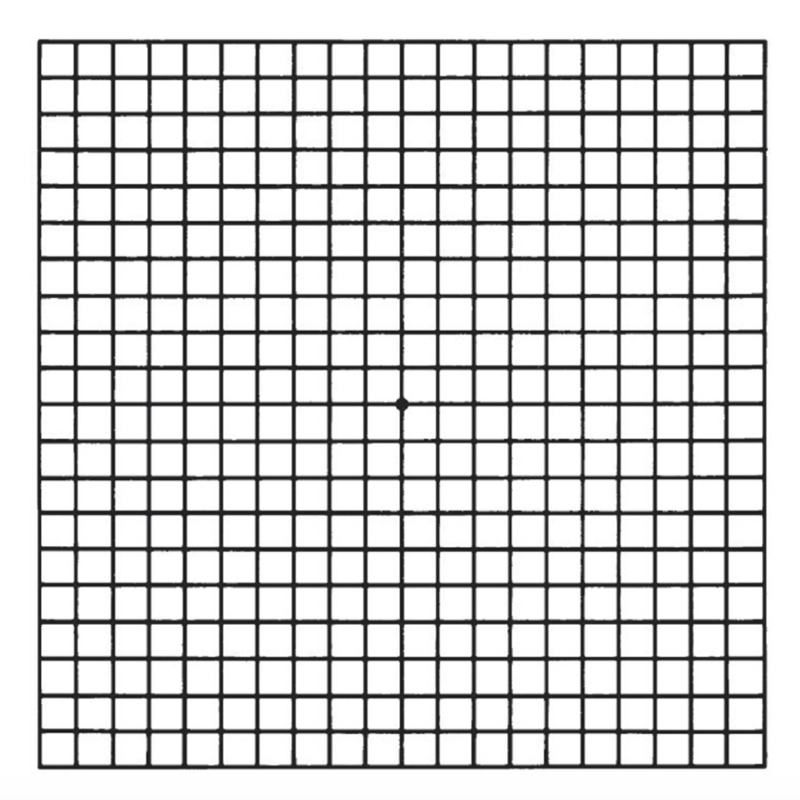 This is why you should use an Amsler grid to check your vision at least weekly. The grid below is for you to use. Keep the Amsler grid in a place where you see it every day. Many people keep an Amsler grid on their refrigerator door or on the bathroom mirror or on the wall next to the toilet. In good light, look at the grid from about 30 cm away. Be sure to wear your reading glasses if you normally use them. Cover one eye. Look directly at the dot in the centre of the grid with your uncovered eye. Notice if any of the lines look bent or wavy. See if any part of the grid looks blurry, dim, or out of shape. Now cover your other eye and test your vision this same away again. Call Dr Chong right away if you notice that any lines or parts of the grid look wavy or blurry.